Winter hardy to USDA Zones 10-11. Thrives in dry to medium soils in full sun to part shade. Salt tolerant. Also tolerates poor soils. Propagate by seed or cuttings. Seed pods split open when ripe discharging seed. Remove developing seed pods before they split open to prevent possible invasive spread of wind-blown seed. Calotropis procera, commonly called small crownflower or giant milkweed, is an upright, spreading, milky-sapped, evergreen shrub or small tree of the milkweed family. It typically grows to 6-8’ (rarely to as much as 15’) tall. 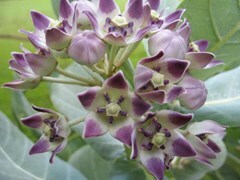 By contrast, Calotropis gigantea (crownflower) is a similar but taller-growing species that typically rises to 15’ tall. Small crownflower is native to Africa, Madagascar, Arabian Peninsula, Southern Asia, and Indochina. It has been introduced and has naturalized in parts of Australia, a number of Pacific Islands, Central and South America, and most Caribbean Islands. In the U. S., it has naturalized in California and Hawaii. It typically grows in open habitats including overgrazed pastures, rangeland, roadsides, river flats and coastal dunes. Noteworthy features include: (a) oblong-obovate to nearly orbicular, light to dark green (sometimes gray-green) leaves (to 3-7” long by 2-5” wide) with short-pointed to blunt apices, nearly clasping cordate bases and dull white veins; (b) waxy, shallowly campanulate (crown-like) flowers (to 1” diameter), each having a five-parted calyx, bell-shaped corolla with 5 broad lobes, and a corona (crown) of five fleshy scales. Flowers bloom in umbel-like clusters (umbellate cymes) throughout the year, with color ranging from white to pink with purple blotching; (c) corky furrowed gray bark; (d) milky white sap (latex) exudes whenever stems or leaves are cut (latex is a toxic irritant to skin, sinus and eyes); (e) fruits (to 4-5” long) are inflated oval pods containing numerous brown seeds with silky tufted white hairs (pappus). Pods split open in fall to discharge the ripened seeds which easily spread by wind to new locations; (f) stout taproot; (g) wood yields a fibrous substance that has been used to make rope; and (h) larval plant for monarch butterflies. Genus name comes from the Greek words kalos meaning beautiful and tropos meaning boat in reference to the flowers. Specific epithet from Latin means tall. No serious insect or disease problems. Aphids defoliate branches in some areas. Sap in eyes can cause severe inflammations. Invasive in pastures, rangelands and hay fields. Where winter hardy, grow as a hedge or train as a small tree. Where not winter hardy, grow in containers which must be overwintered indoors. Could be grown as an annual where not winter hardy.